I went into my local Marshall's yesterday and stumbled upon the Fahrenheit 4 n ONE Curling Iron Set. There were other 4 in 1 available by different brands, but once I opened them I realized they all were the exact same inside (admittedly some were in other colours or had patterns). So I chose the Fahrenheit because it was black. I paid $49.99 for it and used a gift card from Xmas. 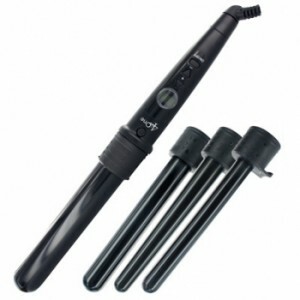 I am really excited to try this one out, it got good reviews over on other sites and I've been wanting a new clipless wand for a long time. The lure of 4 different shapes for this price was too much to resist. Petite Pear Style has a series of videos showing how she styles using her 4 in 1, it is definitely worth taking a look at.